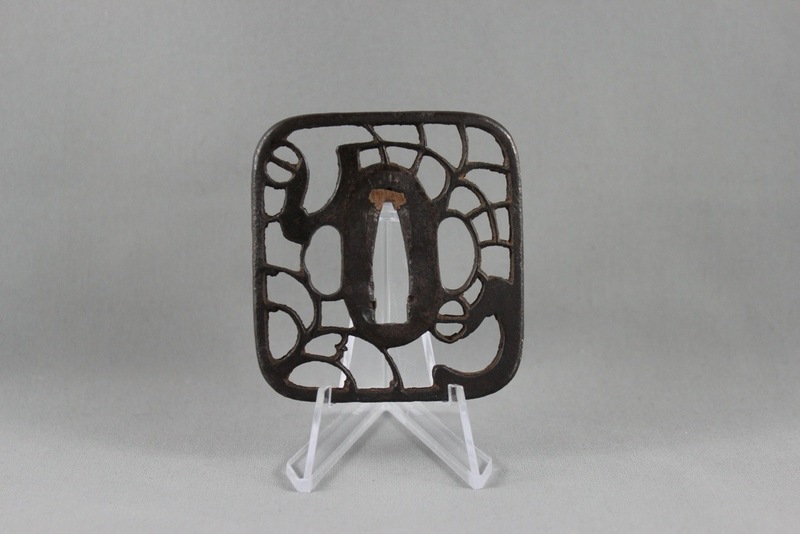 This Kyo-Sukashi tsuba features a design of Musashi-no (Musashi plains), Bird and Abumi (riding stirrups). Mumei. Early Edo period (17th century). Musashi-no lies to the south west of the Kanto district (close to present day Tokyo). Throughout the centuries many poems have been written which describe the view. It is believed that the combination of Musashi-no and Abumi is designed to honour the fallen samurai and their horses that would have littered the Musashi Plains during the many centuries of civil war in Japan. Unlike most Kyo-Sukashi tsuba which are round this particular example is nade-kaku-gata shaped (square with rounded corners). The deep chisel marks around the nakago-ana could indicate the work of a specific tsuba artist or koshirae fitting shop in or around Kyoto. There is a very similar tsuba on Jim Gilbert’s website (http://home.earthlink.net/~jggilbert/kyoto.htm) that shows the Musashi-no design and the same diagonal chisel marks around the nakago-ana. Perhaps these are both by the same hand? Another similar example can be found on page 68 of Masayuki Sasano’s book ‘Early Japanese Sword Guards: Sukashi Tsuba’. 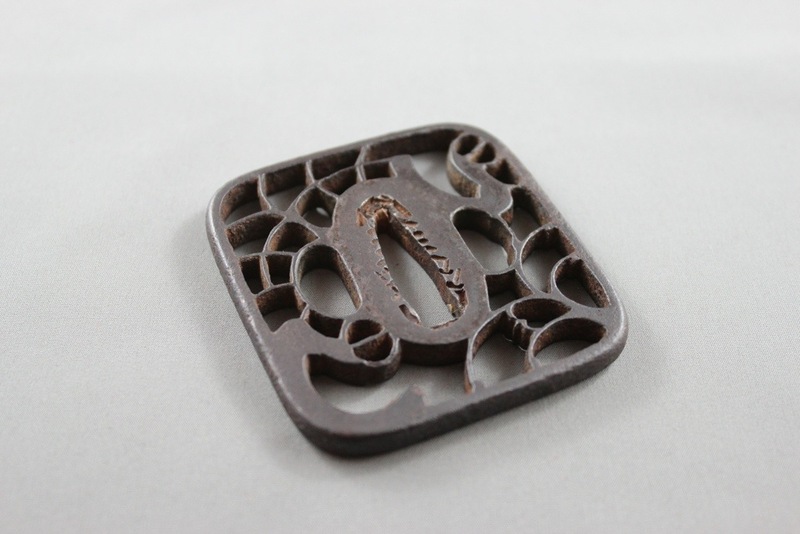 The Kyo-Sukashi school originated in Kyoto during the Muromachi period and was one of the first schools to utilise open-work carving (where the ground is cut away to leave the design in iron). The school was named after Kyoto, which was the capital of Japan for many years. The earliest Kyo tsuba are sometimes called Heianjo-sukashi, after the original name of Kyoto (Heian Kyo – “Capital of Peace and Tranquility”). It is said that this tradition of sukashi carving was created to satisfy the tastes of the Ashikaga Shogunate in the 13th century. Kyo-Sukashi guards are generally thin and round with rounded rims. The iron is uniformly forged and relatively soft. 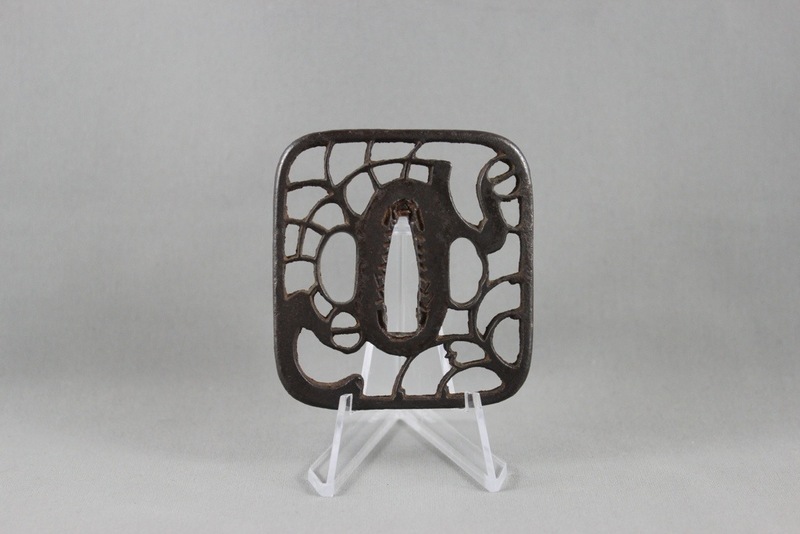 A lot of work went into creating the iron plates for Kyo tsuba to ensure they were suitable for the cutting of fine open-work designs, which was generally in ji sukashi, or positive design style. This is essentially the opposite of earlier Katchushi and Tosho guards which featured designs cut in a negative silhouette. The relatively long and narrow oval seppa dai surrounding the central opening is a key kantei point for Kyo Sukashi and add to their graceful appearance. The walls of the sukashi are generally straight. Fine surface carving is also sometimes used. The hitsu-ana (holes for kozuka and kogai) are also generally elongated and are harmonised with the overall design.